Extension “Biorhythms” is intended for acupuncture therapists – specialists of the Traditional Chinese Medicine. At the same time it can be used by professionals in naturopathy. 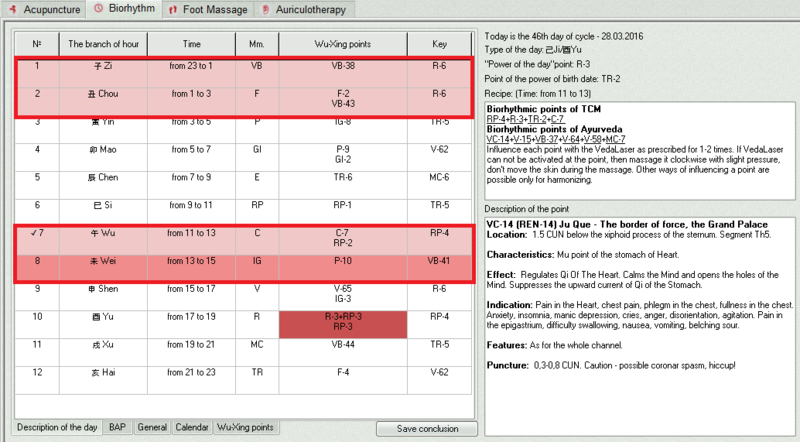 "Biorhythms" is a latest extension for the VedaPulse Professional software. 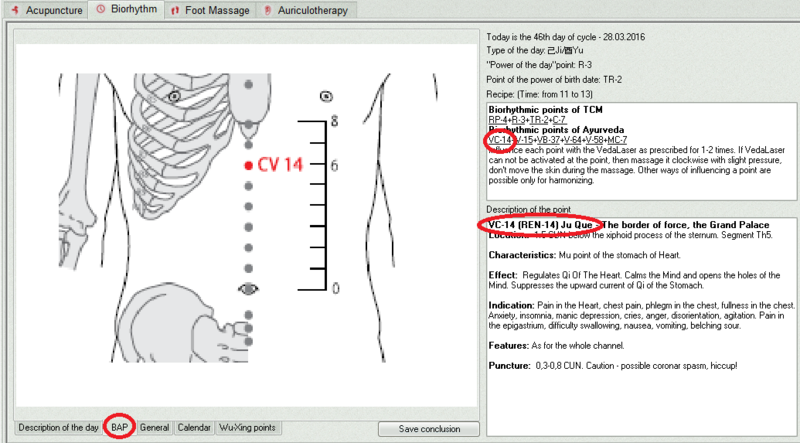 Previously released extension called "Acupuncture" introduced an algorithm, which combined symptomatic treatment for specific diseases and correction of the patient’s energy in meridians as a result of assessment on the VedaPulse Professional device. ​"Biorhythms" extension is the next step. It allows synchronizing the internal and external biorhythms of a patient. 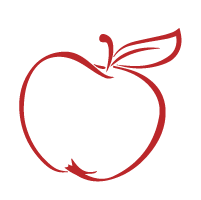 It balances basic functional systems of the body (cardiovascular, digestive, respiratory, etc.) according to natural rhythms. It strengthens the immune system and increases stress resistance. Consumption of adaptation resources during the process of treatment significantly reduces. ​Combination of the Traditional Chinese Medicine (TCM) and Ayurveda algorithms is the unique feature of the "Biorhythms" extension. "Biorhythmic points by TCM" recipe is created on the basis of the classic concepts "Zi Wu Liu Zhu” and “Ling Gui Ba Fa", which take into account individual energy of a person and the energy of the current day. "Biorhythmic points by Ayurveda" recipe is created on the basis of the circadian cycle of the human body activity and current functional state (pulse of the organs). The work with this extension starts with a standard assessment, a five-minute recording of the heart rhythm. Specify the patient’s date of birth to calculate biorhythms. Otherwise, the point of Power of the birthday will not be detected. There are several algorithms for using this extension. Open the "Description of the day" tab after the assessment is done. The box corresponding to the current 60-hour cycle will be marked in the left column. Two recipes of high priority will appear in the upper window. The uppermost recipe includes Biorhythmic points of the TCM, and the lower one - Biorhythmic points of Ayurveda. By clicking on any point in these recipes you will be able to see its description to evaluate its importance for this patient. Relevance of this point can be evaluated by knowing the symptoms of the patient and the results of Meridians evaluation (pulse of the organs), another expert extension. 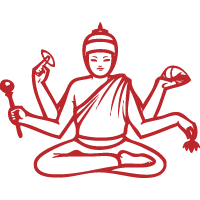 You can additionally give consideration to the crossing point of the TCM and Ayurveda algorithms. Four time intervals and associated channels are highlighted with color. They correspond to the dominant dosha. One of four time periods is highlighted in dark pink color and is associated with the channel of dominant dosha with maximum imbalance. Point with the maximum activity and resonating energy in the current day will be highlighted in the table "Wu-Xing points". 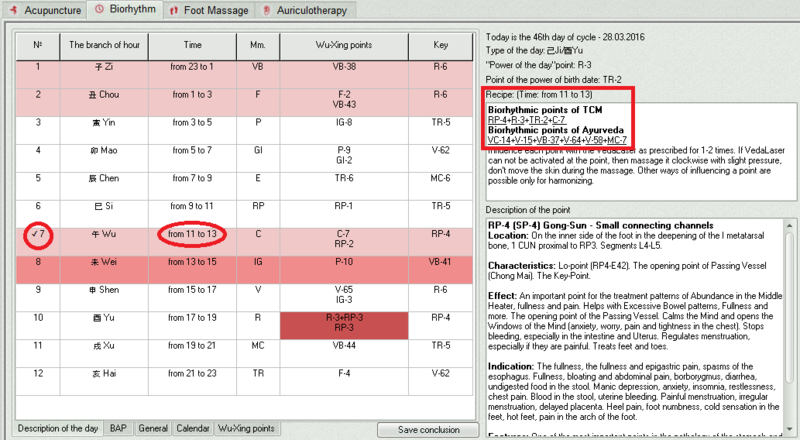 Use recommended points to enhance the effect of reflexology treatment. 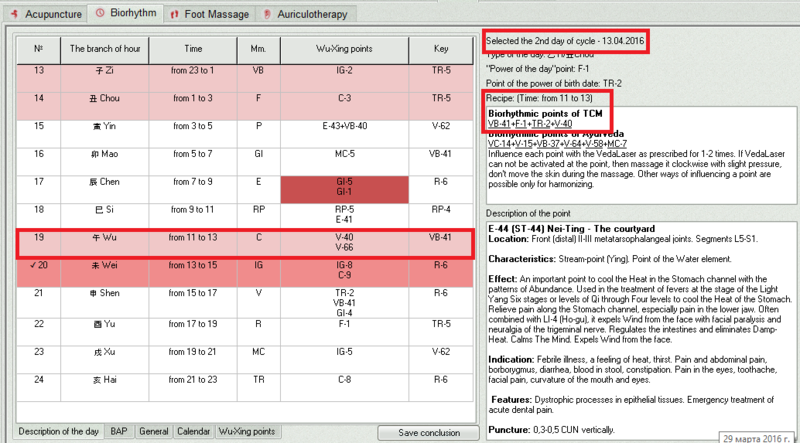 Open the “Calendar” tab and select the day, when the patient can visit you, and study the biorhythmic points of this day in the “Description of the day” tab..
​There is one more scenario. You can open the “Wu Xing points” tab and choose a point, which relates to the imbalanced Meridian. 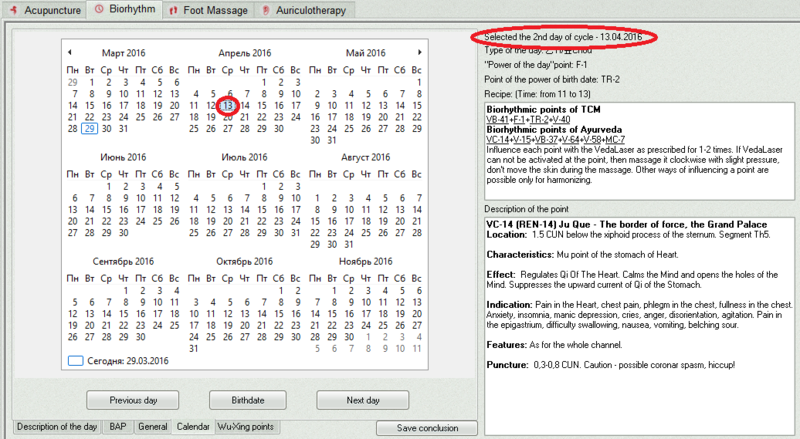 The nearest day of the activity of this point in a 60-day cycle will be calculated automatically. Next, click on “Description of the day” tab to choose the best time for the patient’s next visit. For advanced users who are familiar with the energy of each day in a 60-day cycle: There is a tab called “General” , where you should click on the symbol of the day of the cycle to see the required date in the right part of the screen. Appoint the procedure for this day and select the required recipe. When choosing which recipe to follow — biorhythmic points of TCM or Ayurveda - pay attention to the following moment. Start with "mild" biorhythmic algorithms of Ayurveda if there are pronounced asthenic condition (TP<500 msec ^2 in the Spectrum). Then move on to the "strong" biorhythmic algorithms of TCM. It was noted that using the algorithm of TCM from the start in an acute asthenic condition can cause the patient to feel unwell for some time. Start with the algorithms of Ayurveda to alleviate the healing process. Start with algorithms of TCM if the level of energy is high (TP>1000 msec^2). It is also recommended to alternate the biorhythmic effect and usage of recipes from the TCM (Reflexology/Acupuncture) extension to restore the balance of meridians. Recipe "Biorhythmic points of Ayurveda" The procedure is carried out every other day. Use the procedure #2 from the recipe in the Acupuncture extension during days of rest from the biorhythmic sessions to restore the meridian balance. Course of treatment is 10-15 procedures (including 6-7 biorhythmic sessions). ​Recipe "Biorhythmic points of TCM" The procedure is carried out every 3 days. Use the procedure #2 from the recipe in the Acupuncture extension during days of rest from the biorhythmic sessions to restore the meridian balance. Course of treatment is 10-15 procedures (including 5-6 biorhythmic sessions).